Cate is eight months old now, as of Sunday. In the past month, she's gotten her third tooth (also on the bottom) and learned several syllables (mostly "da," "doh" and "oh") that she likes to repeat. 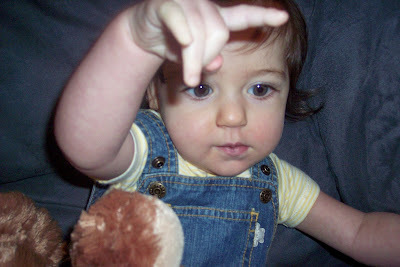 She often uses her pointer finger, although she's still learning it takes two fingers to pick up small pieces of food to put in her mouth. But she'll eat any of our food (chicken, pinto beans, potatoes, bread, creamed corn, green beans, tomatoes, pizza crust, French fries ...) that we give her.